Bringing your kitchen up-to-date may not require a major remodeling project. In fact, taking the renovations one step at a time can be better for both time and budget purposes. A slower approach allows you to focus on each element you aim to change in your kitchen, and you can also ensure that you are selecting exactly the materials, fixtures and faucets that will make your kitchen shine. In other words, you will feel less overwhelmed. When it comes time to update your kitchen countertops you may find that you have an incredibly wide range of materials, styles and colors from which to choose. While there are merits to any and all of these materials, perhaps you can consider using quartz. It is modern, fashionable, and built to last. Some people choose to upgrade their kitchen with the hope of selling their home. According to an article on Inman.com, installing quartz countertops can be extremely appealing to potential buyers. Among its assets, quartz is thoroughly a beautiful material. 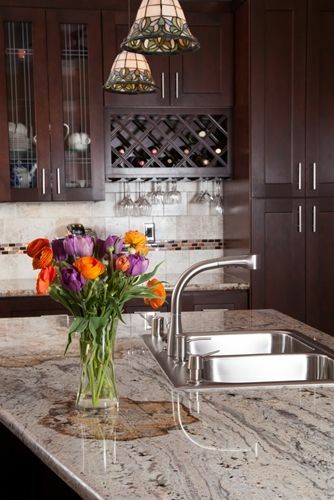 It can often look extremely similar to granite, according to the source, which can elevate a kitchen's appearance. Simply put, quartz can make your kitchen look more expensive and professional, whatever the purpose for your upgrade. According to HGTV, more modern quartz kitchen countertops are made from around 95 percent ground, natural quartz combined with 5 percent polymer resins. This material is extremely hard, low-maintenance and often has the natural look of stone, but can be found in a wide range of colors. For inspiration, you should head over to a kitchen and bath showroom to see samples and get advice on whether quartz is ideal for your needs. And if you're worried about your quartz kitchen countertops withstanding eager home cooks or children's energy, the source added the perspective from an independent home improvement contractor who deemed the material to be essentially indestructible. Have a big family? Like to cook often? Today, the kitchen is not solely reserved for food preparation; it's a place where people gather for homework purposes, large baking projects and simply to hang out. It experiences more traffic. Quartz is antimicrobial in addition to being able to handle great forces, said This Old House, which makes it helpful for preventing bacteria from collecting, plus mold and mildew find it more difficult to grow on the surface. The source added that it is also extremely easy to clean and this can be great for intrepid home chefs or those with small children. Quartz is very heavy, but it can be installed in slabs, said This Old House. This means it can be incorporated into the kitchen seamlessly in many cases, avoiding a less-elegant piecemeal feel to the countertops. However, because of the material's weight and foibles – until installed, it can crack if not handled properly, the source noted – it is best to hire a professional for assistance. However, if that is your greatest concern about using quartz for your kitchen countertops, it is honestly a minor thing when all its benefits are considered. Talk to your kitchen and bath showroom representatives for more help, but don't count out quartz as a classy, strong material to use for your new kitchen countertops.